Leaf: blade 2.5--6 mm wide; sheath front ribbed at least in lower 1/2, translucent > 10 mm below mouth; contraligule generally 5--13 mm. Inflorescence: dense above or open, 2.5--8 cm, generally +- white or green (to pale brown); spikelets often > 1 per lower node or branch; inflorescence bract bristle- or leaf-like, base clasping stem or not; pistillate flower bract +- covering peri, generally white, occasionally gold or +- brown, with green to gold center, awned. Fruit: 1.2--1.6(2) mm, 0.8--1.2 mm wide; peri ascending, 2.9--4(4.8) mm, 1--1.7(1.9) mm wide, ovate, planoconvex (biconvex), green to pale gold, +- abruptly narrowed above, flat margin including wing generally 0.1--0.25 mm wide at midbody, veins generally strong both sides, beak generally cylindric, +- entire generally for < 0.4 mm, pale. Ecology: Common. Montane meadows, open forests, edges, roadsides, moist or dry soil; Elevation: 250--3300 m. Bioregional Distribution: KR, NCoRH, CaRH, SN, SCoRO, TR, PR; Distribution Outside California: to Washington. 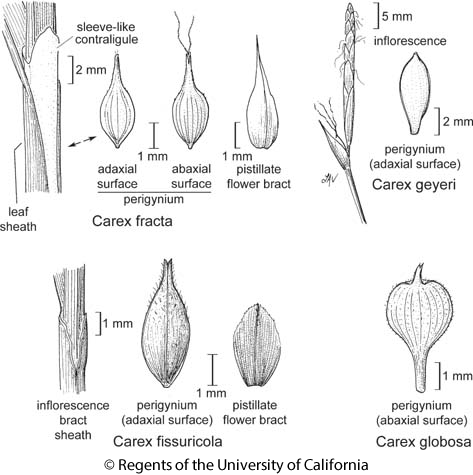 Fruiting Time: May--Sep Note: Like Carex feta but spikelets generally more clustered. Unabridged Note: Variable in ligule length, inflorescence bract length, stem diam. Citation for this treatment: Peter F. Zika, Andrew L. Hipp & Joy Mastrogiuseppe 2015, Carex fracta, in Jepson Flora Project (eds.) Jepson eFlora, Revision 3, http://ucjeps.berkeley.edu/eflora/eflora_display.php?tid=17434, accessed on April 20, 2019. KR, NCoRH, CaRH, SN, SCoRO, TR, PR; Markers link to CCH specimen records. Yellow markers indicate records that may provide evidence for eFlora range revision or may have georeferencing or identification issues. Purple markers indicate specimens collected from a garden, greenhouse, or other non-wild location.